Who doesn’t love meatballs and likewise who doesn’t love cheese? Place pieces of fresh mozzarella inside your meatballs and give your guests a little surprise of cheesy goodness. This meal is perfect for when you have another couple coming over, your parents or even the in-laws. This recipe makes plenty more than for two so if you want cut the recipe in half, savor in leftovers during the week or share with some office friends at lunchtime either option is sure to please! – Heat olive oil in pan. – Sauté garlic & basil till cooked through. 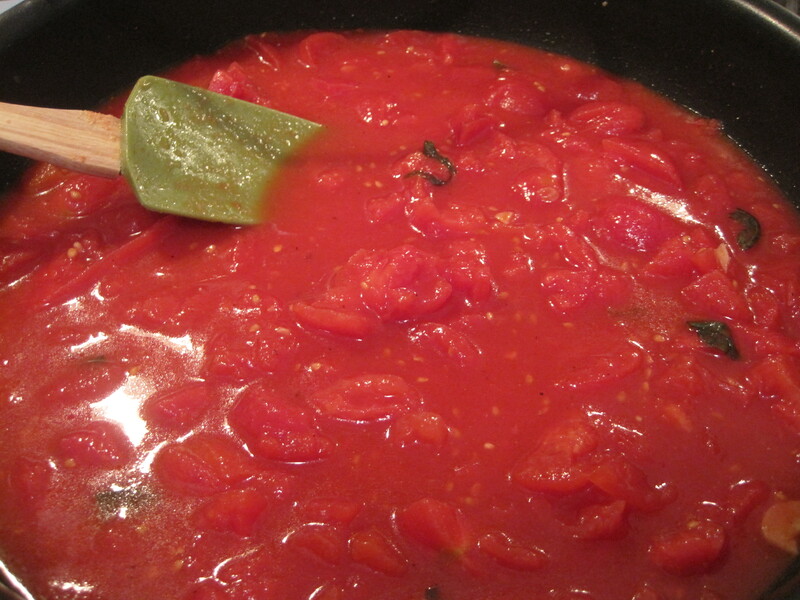 – While the above is sautéing remove the whole tomatoes from the sauce and chop up into chunky pieces. – Place tomatoes and sauce into the pan. – Add tomato paste & red wine. – Let simmer for a minute or so while spinning. – Then add in a sprinkle of salt, black pepper, garlic powder and pepper flakes. – Cover pot and place on low heat while you prepare the meatballs. *You must check the sauce and stir occasionally. 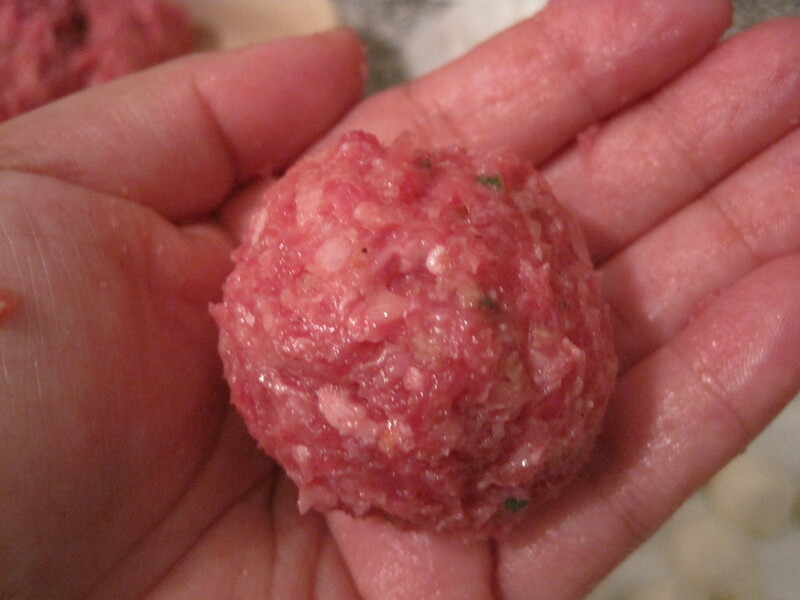 *1 to 1.5 Pounds of Beef makes about 25 or so meatballs. *I used the insides off the end of a day old whole wheat Italian bread loaf. – Cut the mozzarella balls in half as prep before mixing the meat together and put on plate off to the side. 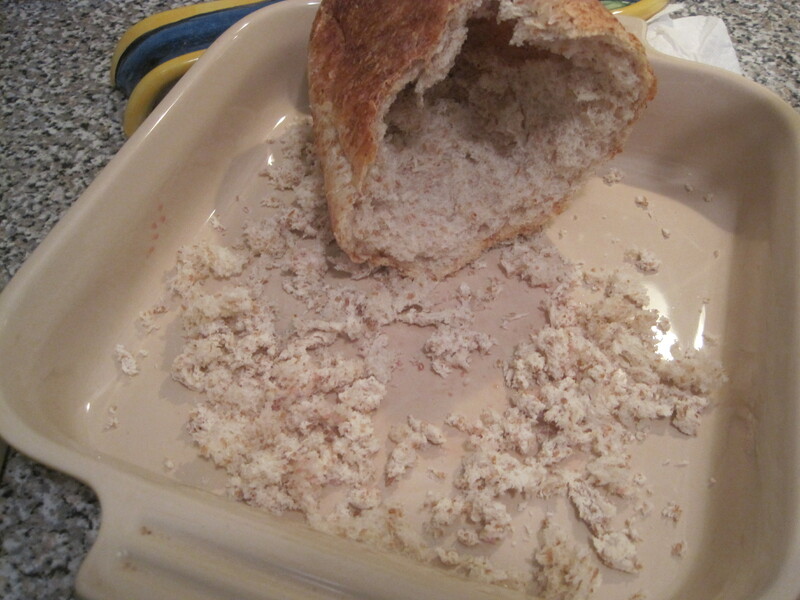 – In a dish by hand pull the insides of the fresh bread out and crumble the bread as shown in the photo. – You will then need to soften the bread crumbs with the milk. – Mash the crumbs with the milk till all is melded together. 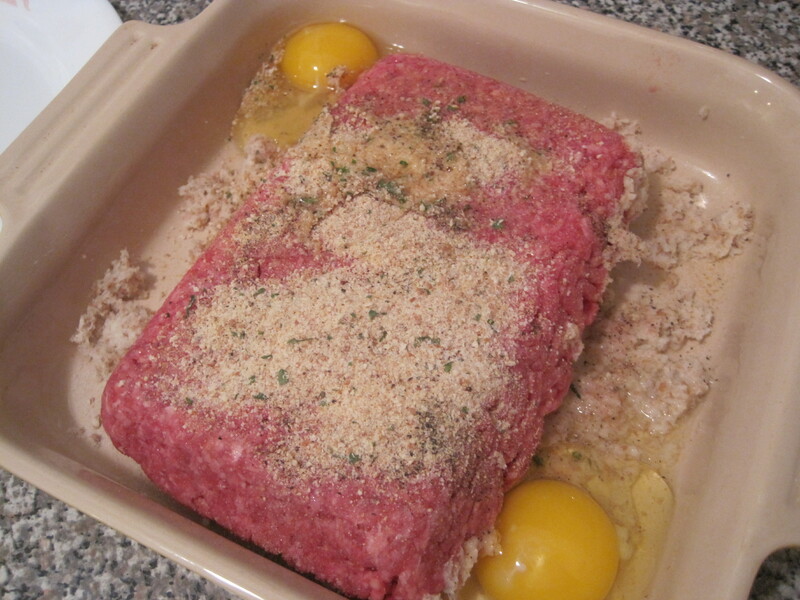 – Place the meat in the dish and top with a couple of sprinkles of all the seasonings. – Next crack both eggs up top and throw the bread crumbs in too. – Mix all together and add in again more sprinkles of the seasonings. – Once mixed together take a golf ball sized portion and place it in your palm. – Make a dip in the portion by pressing your fingers into the middle. 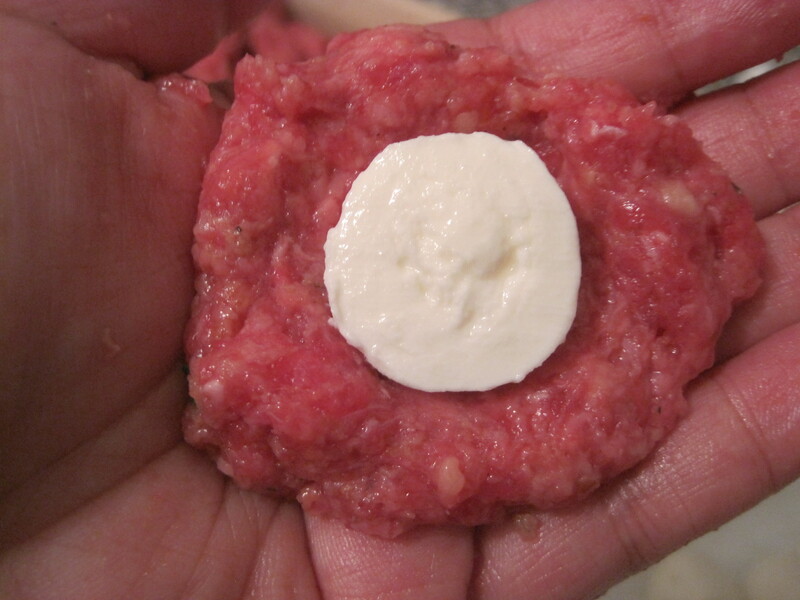 – Place a piece of one mozzarella half into the dip and then close up with meat around the mozzarella. – Gently in circular motions round out the meatball in between your hands. 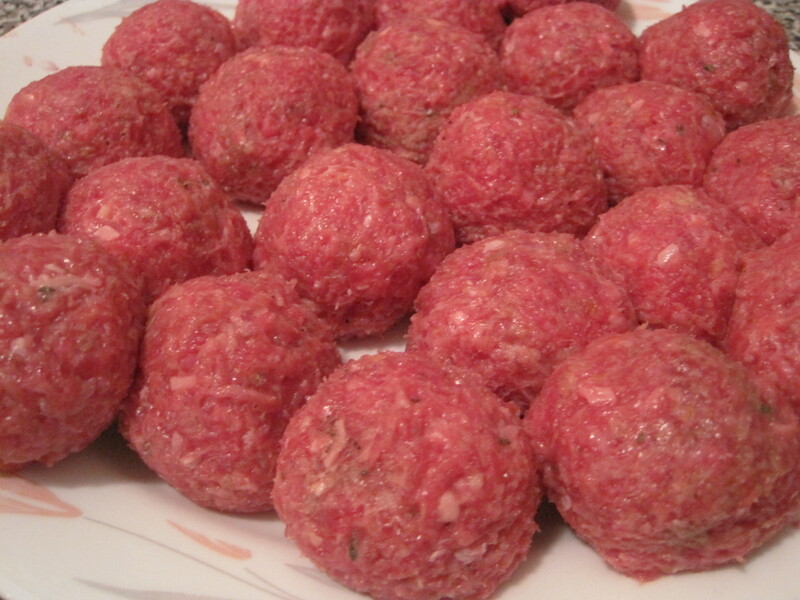 – The meatballs should be the size of golf balls – place them on a plate as you continue making them. 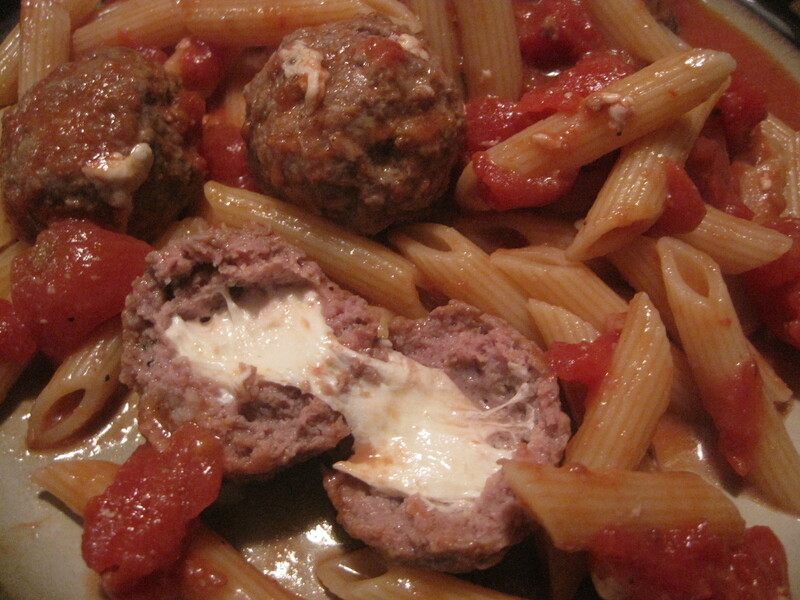 *Have your pasta water heating up to a boil before you put meatballs in the sauce. 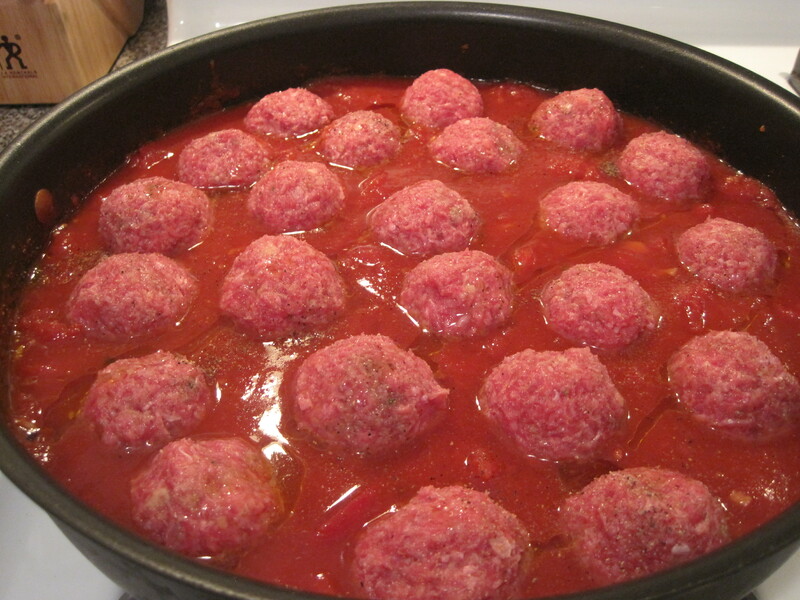 – Place the meatballs in the sauce as shown. – Put on medium heat. 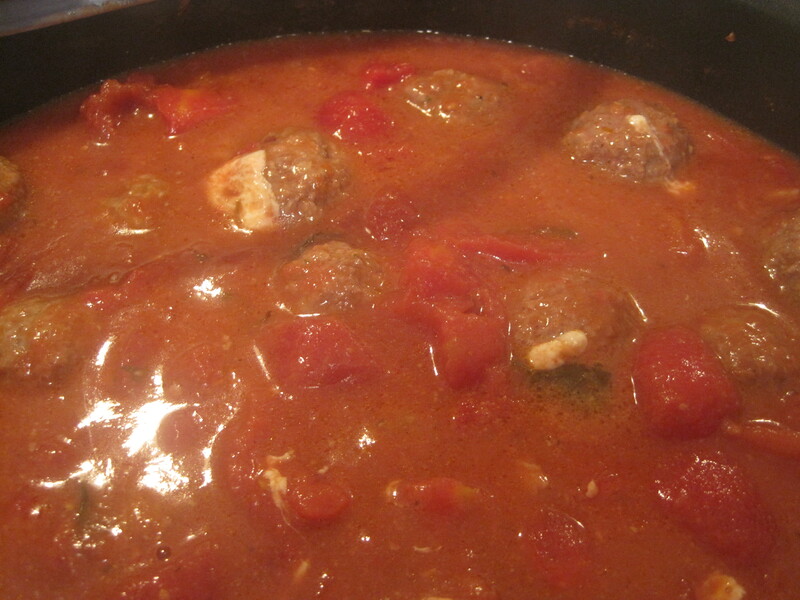 – Sprinkle one more dash of seasonings and a splash of olive oil on top of the meatballs in the sauce. – Then cover and let simmer for about 10 minutes. – Bottoms should now be cooked and you should be able to turn the meatballs over in the sauce. – Again let the meatballs simmer for another 10 minutes and turn. *Don’t be discouraged if you see the cheese melting out of some of the meatballs. 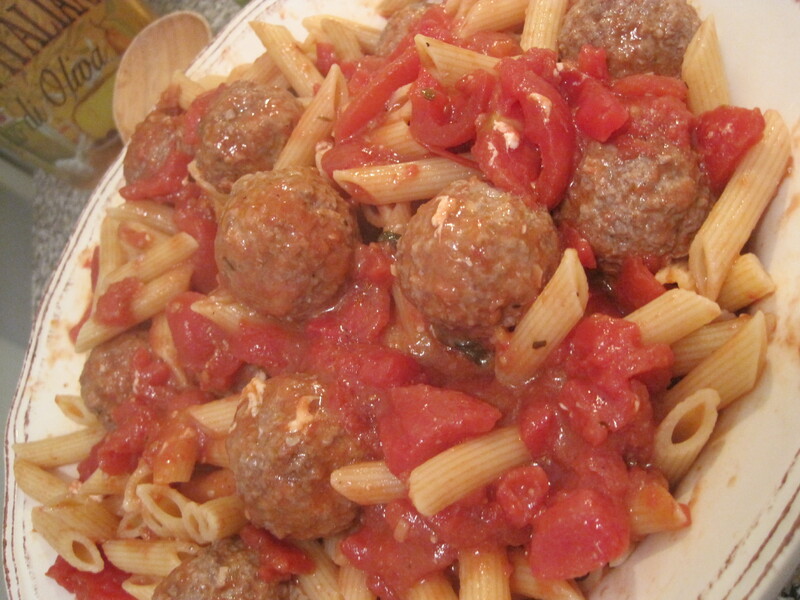 – Keep the meatballs simmering in sauce until pasta is cooked through then turn off the sauce. 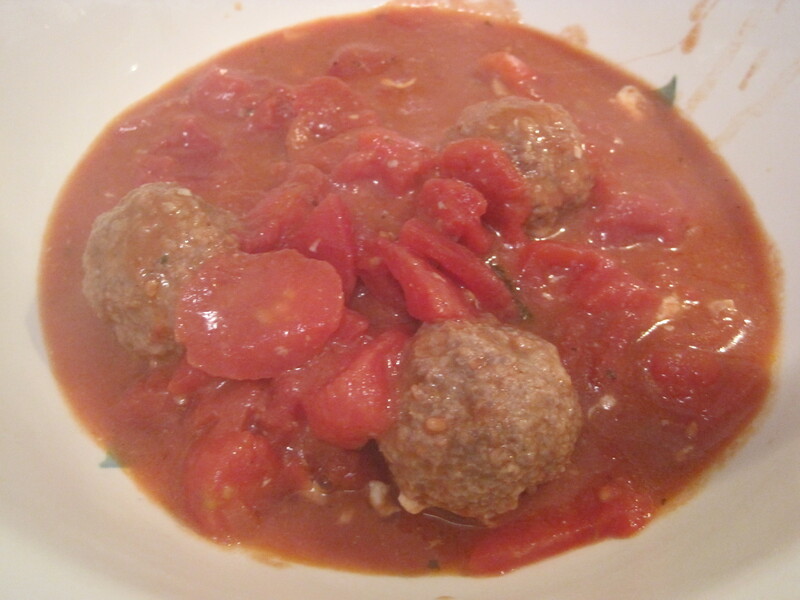 – Place some of the meatballs and sauce at the bottom of your serving bowl. – Drain the pasta and throw into the serving bowl. 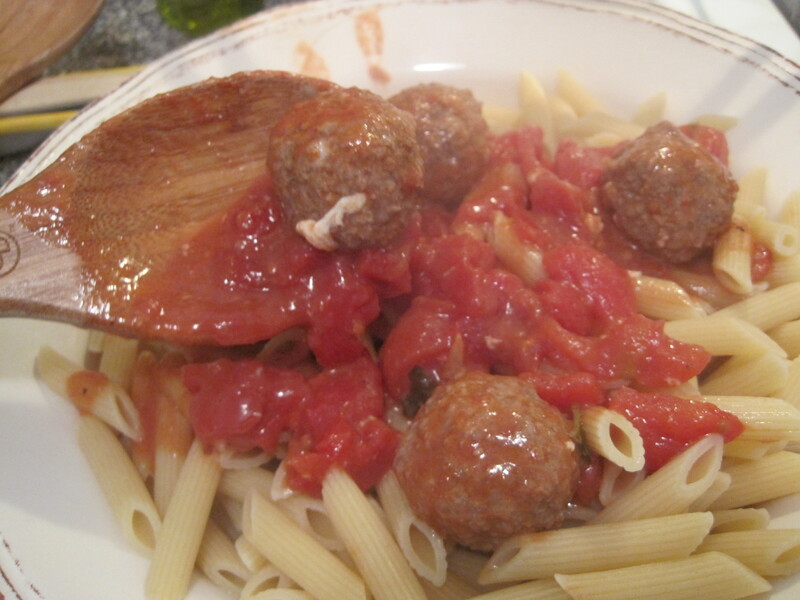 – Place the sauce and meatballs over the pasta and toss till everything is coated. *Note you can always swap out the ground beef for ground turkey and change up the cheese for Parmesan or Asiago. *If you don’t feel like pasta – throw the meatballs onto some toasted Italian bread for a meatball sub – sprinkle some grated parmesan on top before serving. 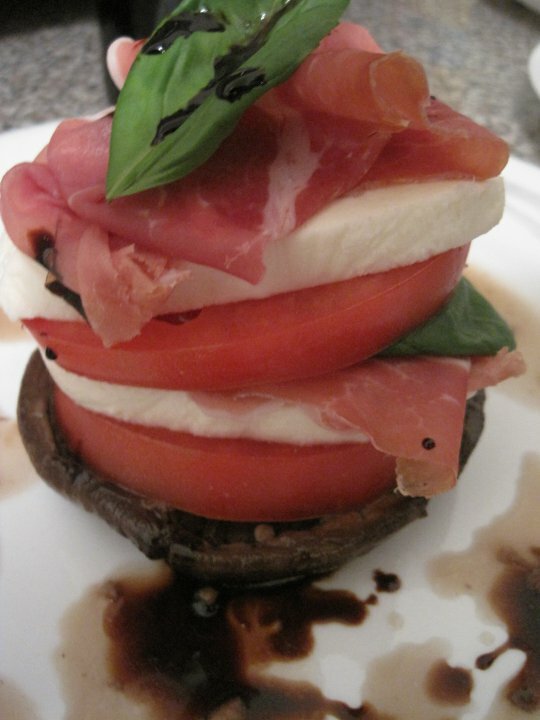 I adore mushrooms – Portabella mushrooms are hearty and the perfect platform for my salad tower you see here. It’s fancy without being too rich with the ingredients and super simple to make! – Soften the Portabella Mushrooms by cooking on low heat in a pan with tablespoon of olive oil and ½ cup of red wine. – Season mushrooms with a sprinkle of salt and pepper. – Keep covered and turn over mushrooms periodically as they soften. – You want the mushrooms cooked through but not soggy. – Be gentle with them as they may be fragile when soft and you want to keep them whole. 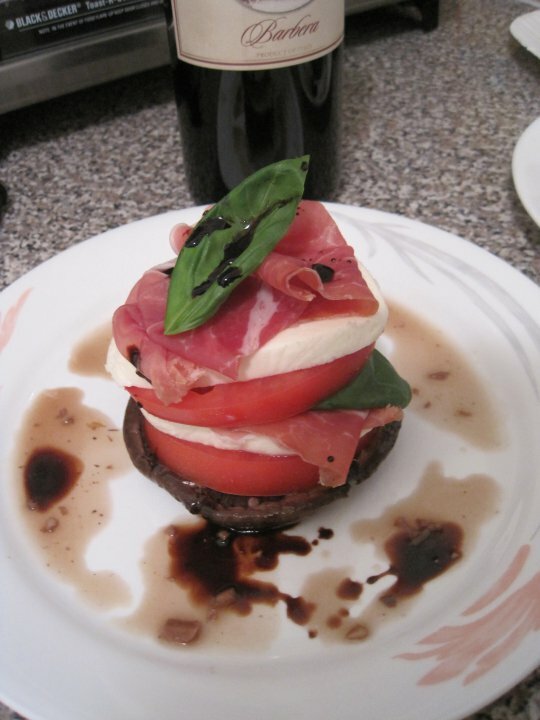 – Take ½ Cup Balsamic Vinegar and combine with 1 teaspoon sugar and 1 tablespoon soy sauce. – Bring to boil and reduce heat to low and simmer (stir frequently) until thick and syrupy, about 20 minutes. Remove from heat and let cool. – Cut the tomato into (4) ½” thick pieces – discard or save leftover pieces for your future use. – Toss the tomato pieces in 1 tablespoon of olive oil and a pinch of salt. * Be sure to use the middle parts of the tomato not the tops or bottoms. 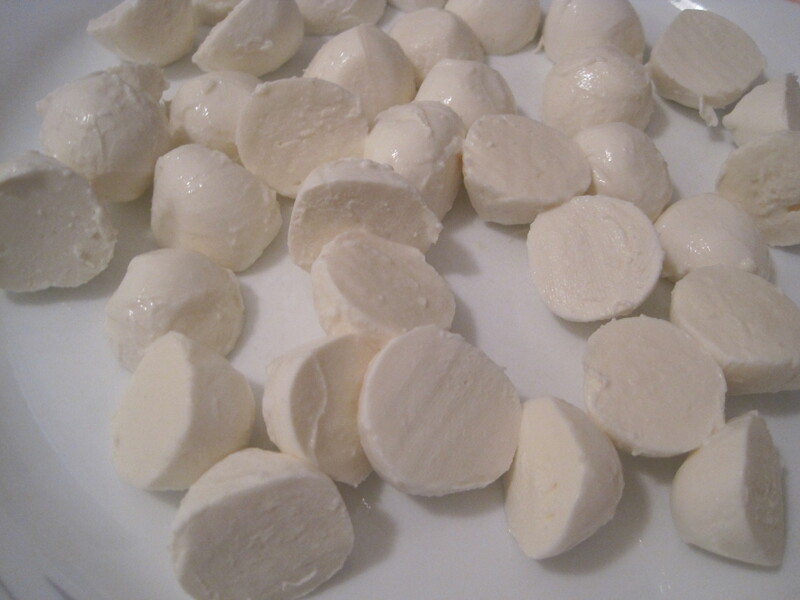 – Cut the mozzarella into (4) ½” thick pieces – save the leftover pieces for your future use. – Place mushroom on the plate – do not take any of the juices from the pan. – Place on top one piece tomato. – Place on top one piece mozzarella. – Place on top one folded piece prosciutto. – Place on top one basil leaf. – Repeat steps 2 through 5 & then top tower with drizzle of balsamic glaze. – Repeat all steps for the second tower. * You can swap out the mozzarella for thin slices of ricotta salata and the red tomatoes for yellow ones. * Also feel free to try a flavor infused olive oil instead of the balsamic glaze.